Working in libraries is VERY serious work. No fun, ever. Okay, I'm just kidding. Working at the Lawrence Public Library is far and beyond the most enjoyable job I've ever had. I get to spend my day talking with kiddos about books they like, making crafts, and meeting fantastic people. One thing I've never done in my almost two years of working here is to play any of the board games we have in the children's department, despite the fact that I'm the one who fixes them and replaces the parts. I had a mission to complete. I went to my coworker Matt to see if he would aid me in my very serious quest. We decided to play one of the most popular games in the children's department, Bugs in the Kitchen from Ravensbuger. Bugs in the Kitchen is a fun little game that includes a hex bug, a tiny robot that skitters around the board. Players try and trap the bug by moving obstacles in the bug's path in order to shepherd it into their corner. Between the bug's unpredictable movements and problem solving, the game is unique and exciting. While I can't speak for how Matt felt about the game, I had a blast. We only played two rounds and each won one of them. I wanted to keep playing, but I had this post to write. I have to admit, I don't play board games that often. I REALLY like winning, which makes me not a ton of fun to play with. Still, I liked Bugs in the Kitchen so much I'd be willing to play it again. 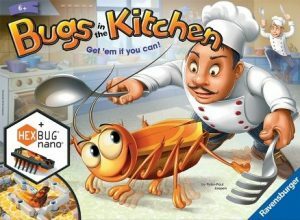 You can find Bugs in the Kitchen and tons of other board games over in the Children's department. Unlike our circulating board game collection, these can only be used in and around the library. The bug and the die needed for the game are kept at the front Children's desk. Have fun and happy board gaming!